Manager performance review document is established to ensure individual employee skills by reviews manager records & performance. 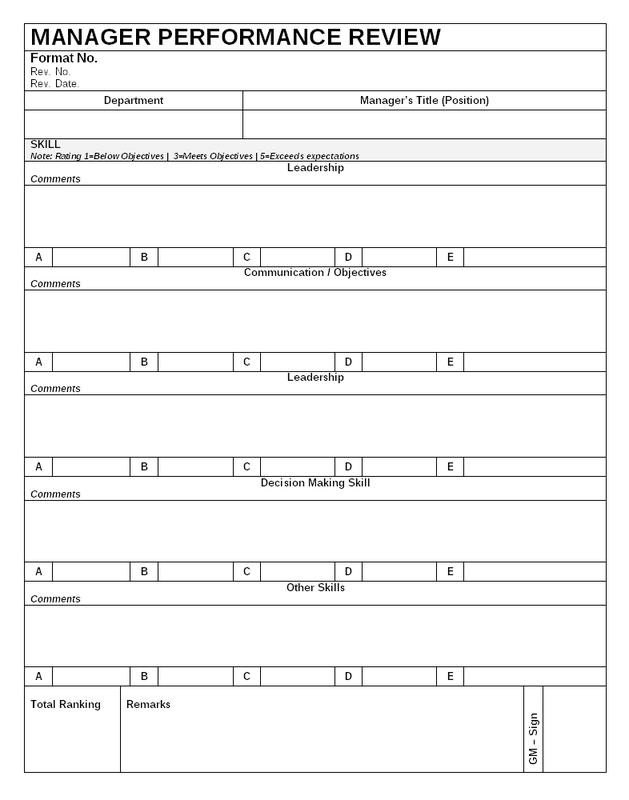 Manger performance review document is prepared and used for the conducting individual employee information and review records to verify performance of manager and supervisor level personnel for the verification of individual skill. The purpose of the manager performance review process is to identify individual managers, supervisors’ skill and performance in workplaces for the improvement. The procedure is conducted by human resources department and same are managed records to verify and handled for further trainings. In the manager performance review document mostly consider some important part of the skill or advance skill required to managing all the concern activities, manpower, machinery and equipment that should be proper verified or considered on priority. Leadership is one of the important skill that required for manager and supervisor level personnel, so person should be mange and create positive work environment for peoples and provides proper guidelines, and growth opportunities to each one of department. Manger / supervisor should be conducted communication with each employees, departments and manage the objective of the company, and should be well decision making actions, rapidly and correct conclusions for identified each problem within department. There are so many requirements that needs in manager / supervisor level personnel that important to verify manager performance review to provide more training to individual and department growth. Manager performance review is appraisal procedure that helps to determine actions for the needs of training to particular person for particular subject, so it’s important that each manager / supervisor’s individual performance review should conducted and records are maintained for improvement. Manger performance review records are handled by human resources department and verified by manager to proper posting, incensement and training concern. The records are maintained and disposal is considered as per standard system and retention period.